Thank you for visiting my website. You are curious who runs EspressoCupsGuide.com? My name is Jana and I am an absolute coffee freak. A few weeks ago I bought my first Nespresso Pixie Espresso Maker – it works perfect and all guests love it as well. Even my brother in law – who has more coffee in his venes that blood – bought it right after having his first espresso. At first I just used my plain coffee cups to make my espresso. But I realised soon that the espresso didn`t taste like the espresso I get in my next door coffee shop. I tried other espresso capsules, but this was not the reason why my espresso didn`t taste like an Italian made coffee. I have searched the web and figured out that espresso taste is related to the temperature of the espresso. 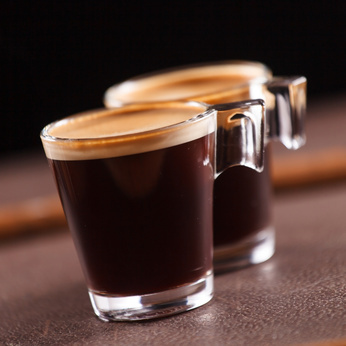 As I have only used my simple coffee cups the temperature of the espresso dropped immediately as I filled the espresso in the cup – as the espresso has only 2 ounces for a single shot it was cold before I drank it. I realised that I had to buy the right espresso cups to enjoy my Italian way of life. As I have a superb machine I was looking for the best espresso cups. There is so much information out there about the perfect espresso machines and beans, but I found it very hard to get good infos on the right cups to make perfect espresso that stays hot for a while. So I have spend lots of time on the internet and Amazon to compare the nice looking espresso cups. Not all of them are suitable and some reviews were horrible. On my website I have put together an Espresso Cups Guide. Its an interactive chart that allows you to view and filter the information you want to see to find the best espresso cups. As I do more research, I`ll let you more about the perfect espresso cups, in-depth reviews of the demitasse and more information on espresso. I am not an expert in coffee or espresso – I just love to drink it. So I hope you find here the best espresso cups that suits your needs and you save precious time to find your best demitasses.